Complete online intake questionnaire form for Eviction Proceeding and/or Civil Lawsuit For Unpaid Rent. We prepare paperwork & prepare you for your hearing. We attend court on the hearing date(s). 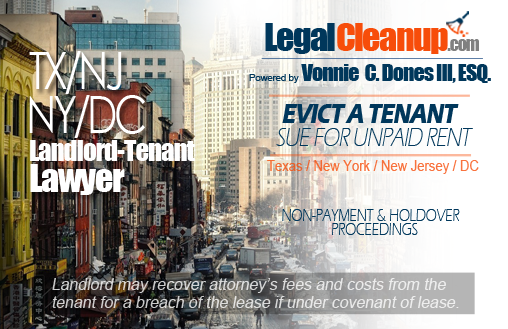 Texas, New York, New Jersey, & Washington, D.C. Landlord-Tenant Lawyer Helping Landlords Evict Tenants and Sue For Unpaid Rent. Is a tenant neglecting or refusing to pay rent or habitually pays late? Is a tenant violating housing and building regulations, a lease term, or damaging your property? Does the tenant disturb the peace or the quiet enjoyment of others? Is the tenant’s conduct disorderly? If so, we can help you take the proper steps for an eviction. You receive peace of mind knowing that you have an attorney handling your lawsuit every step of the way. We will provide the proper notice, file a complaint, seek judgment for possession, and sue for unpaid rent. Failure to pay rent or increased rent. Destruction or damage to property caused willfully or by gross negligence. If you have “good cause” or a legally sufficient reason to evict a “bad” tenant, you may file a complaint or petition against a tenant, so as long as you follow the proper legal requirements. Under Texas, New York, DC, and New Jersey law, a tenant is required to comply with the terms of the lease and follow housing and building regulations. If a tenant violates a lease term or a housing and building regulation there are several steps you must take to exercise your rights as a landlord. File a petition or complaint for an eviction.